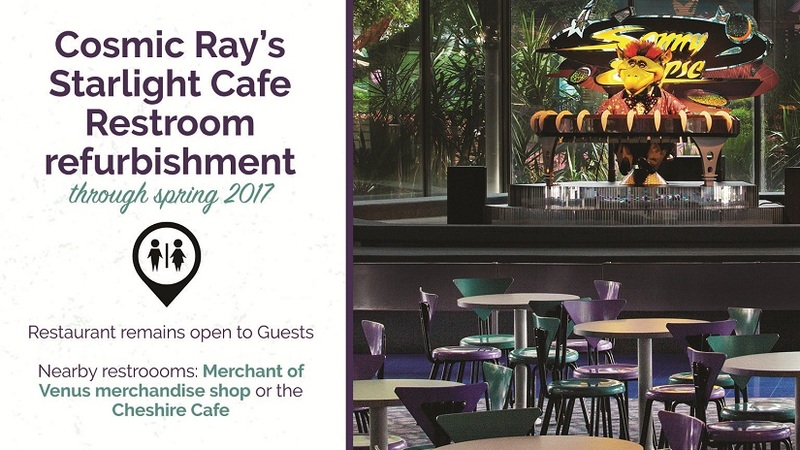 A number of enhancements are happening at Cosmic Ray’s Starlight Café, the busiest quick-service dining location at the Magic Kingdom Park. The restaurant will continue to remain open throughout construction work. Currently, the Guest restrooms inside of the restaurant are closed to begin remodeling and expansion. Guests will be directed to the nearest restrooms by Mickey’s Star Traders (also located in Tomorrowland) or the Cheshire Café (located in Fantasyland, right across from Cosmic Ray’s). In addition to that, construction has started around the exterior of the building as more covered seating areas are added to accommodate an even larger number of Guests. The project will take place in phases. Completion of work on these areas within the restaurant is expected to be completed by this summer.